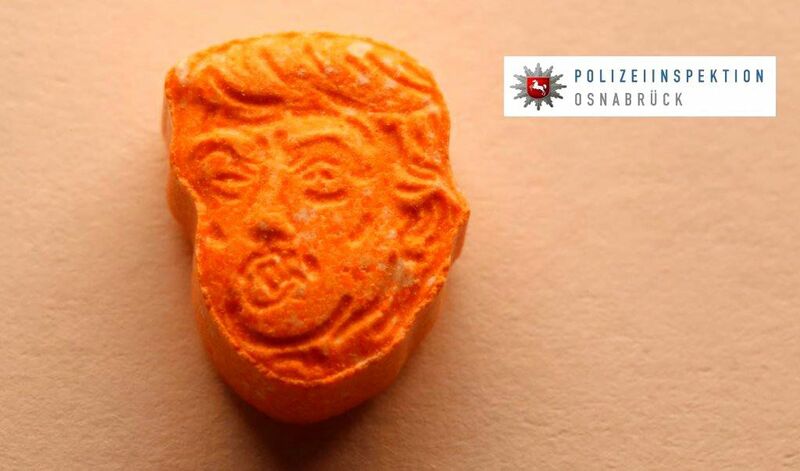 JT IRREGULARS: "Busted, so to speak: 'Donald Trump' ecstasy tablets seized in Germany"
"Busted, so to speak: 'Donald Trump' ecstasy tablets seized in Germany"
"German police say they have seized thousands of tablets of the party drug ecstasy in the shape of Donald Trump’s head, a haul with an estimated street value of $45,900. "Police in Osnabrueck, in northwestern Germany, say they found the drugs while checking an Austrian-registered car on the A30 highway on Saturday. "They say the people in the car, a 51-year-old man and his 17-year-old son, told officers they had been in the Netherlands to buy a vehicle but hadn’t succeeded so were returning home. "Officers said they found about 5,000 of the orange, Trump-shaped ecstasy tablets along with a large, but unspecified quantity of cash. "A judge on Sunday ordered the father and son kept in custody. The car was seized and towed away."